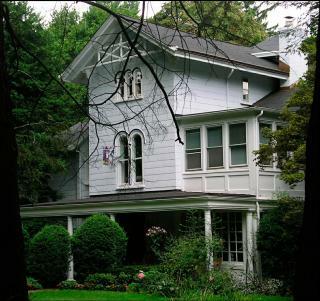 This residence, the first house designed by Alexander Jackson Davis in Montclair, was built for his friend and business associate, Llewellyn S. Haskel, a drug importer from New York. In 1852, Haskell moved to the top of Orange Mountain (now Eagle Rock Reservation) where he remodeled a farm house and began to purchase land for Llewellyn Park. 84 Llewellyn Road was once 12 Eagle Rock Way. Original drawings show the architecture to be Italianate. Some of the original brackets remain under the tower eaves and those of the south wing. The balustraded balcony over the main entrance was lost in subsequent alterations. In 1860, Samuel Wilde, a coffee and spice merchant important in the development of Montclair, purchased this home prior to completion from Haskell. He finished the construction and improved on the grounds. Building documented in the 1971 survey of town by the Montclair Historical Society. It was also pictured in the Montclair state photographic exhibit, “Cottages Villages & Country Residences”. This Italianate style of architecture was recommended by Andrew Jackson Downing as being both picturesque and practical. The Llewellyn Haskell House is listen on both the State and National Register of Historic Places.